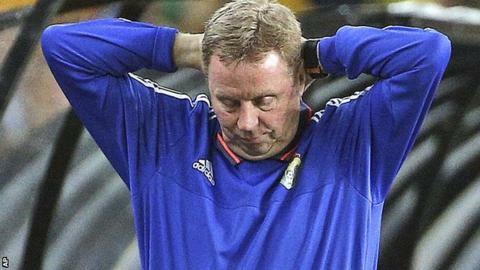 Harry Redknapp's second game in charge of Jordan ended in a 5-1 defeat to Australia in 2018 World Cup qualifying. The former West Ham, Portsmouth, Tottenham and QPR boss began his reign with an 8-0 thrashing of Bangladesh. But two goals by Tim Cahill plus strikes for Aaron Mooy, Tom Rogic and Massimo Luongo sealed a comfortable success before Abadallah Deeb reduced the deficit on 90 minutes in Sydney. Englishman Redknapp is only contracted for two games as Jordan boss. "I've enjoyed it apart from today," he said. "No one enjoys standing on the touchline getting well beat." He added: "The players did their best. We all did our best but what can you do? I've been here five or six days, what can you do? "The players are the players, I can't suddenly bring in Ronaldo. It is what it is. They tried their best but they were beaten by a better team." Redknapp said Jordan would need to make changes if they ever hoped to qualify for a World Cup for the first time. "The whole structure, the set-up needs so much work," he said. "We've got no analyst, we don't have anything on the opposition, we don't have sports scientist." Jordan had inflicted the only defeat of the campaign on Australia, who progress to the next round of Asian qualifying after topping Group B.
Jordan are second in the table and could still make it through.